[/media-thumb]Hi all, I've been trying to find a solution to this all over the place but no one seems to have the right answer yet. I'm printing a rc model Spitfire from 3d LabsPrint and having an issue. Using Cura 15.04 as the settings provided by 3d LabsPrint are for that version, the outer skin of the plane prints nicely but I end up with gaps in the print on the inner structure pieces. When I watch the printer closely it appears to be the gaps are from where the printer has a retraction and moves to or from that place. There is an oval shaped tunnel in the wing for the servo wire to go through and the issue is most noticeable there. It looks like when the print head goes around the oval the start and stop point do not meet up. I've also tried it in 2.5 and 2.61 with no success because some of the manually set settings for the print have dependencies to other values so it won't let me change them. When I tried I ended up with just the outer skin printing and no inner structures. This is getting really frustrating...no matter what settings I've tried to tweak so far the problem persists. Also this starts happening at 3% of the print. Up to that point the print is very good. Did you see the problem in layer view? Could it just be skipping that section? Thin walls sometimes dont' get printed. Try setting nozzle width/line width to 0.2 just to see what happens in layer view. You can certainly fudge it a bit - .3 line width with a .4mm nozzle will work. In cura 15.X it's critical to make the shell width a multiple of the nozzle width. If not it will ignore the nozzle width. Hey, I just finished printing 2 P47's from 3d labs using Cura 2.6. I can confirm their supplied settings will work with a few speed and retract settings. What I did first, and it helped a lot, was I nailed the "First Layer Height". I printed a 1 line skirt, stopped the print, measured it, and adjusted a G92 Z in my printer config to establish a perfect First Layer Height. Next, I printed a one walled test box, about 50mm square, maybe 10mm high. Measured the wall thickness and adjusted my extruder percentage. Currently I am actually at 89% even though I calibrated my extruder steps perfectly. Not sure why its so low, but it produces awesome results. 67C Built Plate, 220C Print Temp First Layer, 210C everything else. No Top or Bottom layers. Now looking at your pick, I am guessing you have an oozing problem from possible poor retract, or moving to slow from point to point to point. This is why I jacked my travel up to 200mm/s. I will get back to Retraction Extra Prime in a sec. Now I was getting strange issues like you had, and I was also getting blotches all over the print, so I changed my Z seam to be aligned into the same location on the model. When I found when I did this, was every time I went to start a new layer, my nozzle would ooze a tad and when it went to start the next layer, I had a bit of an under extrusion right at the start. Very hard to see this if the Z seam is scattered all over the place randomly. Once I aligned the seam, I could clearly see the under extrusion, and so I adjusted the "Extra Prime" amount. I had to play with it a bit, but I got a good value that works pretty well. Good luck, enjoy. This was a blast trying to print these models. I wasted a whole spool of filament trying to dial it in before I printed my real one. Huh? What's a G92 Z? I did a 1 wall heat test and flow test and came out with 210 degrees and 105-110% flow for best layer adhesion. Pretty close to the same settings I have been settling on with Cura 15.4. Except for the travel speed. I'm not sure my Anet A8 is capable of those speeds. I've tried up to 150mm/s and it doesn't seem to be going any faster than at the lower settings. Mine is direct drive also. I've tried from a .5mm retraction distance all the way up to a 20mm retraction distance and still have the same amount of stringing. Wouldn't you want a faster retraction speed to reduce stringing? What is Z seam? And how does one align it? With 2.6.2 I'm not even this far because none of the internal structures print or show in the layer view beyond the first layer. The pic I posted was using 15.4. In layer view only the 1st layer shows internal structure...which is probably why it prints that way too. I haven't been able to figure out how to get the interior structures to show in layer view. I've made several changes since the original post...upped the heat to 220 degrees, slowed down the print to 40mm/s, took out the z-hop I had, and lowered the layer height to .15. These all helped but the problem isn't gone. There are less thin sections but still several holes. When I watched the print a few times it seemed like the extruder was stopping about .5mm short of the start point when hopping to a new start point. I have a feeling this is where the holes are coming from. If you don't see something in layer view then it won't print. Cura looks at your nozzle size, shell width and comes up with a "line width" internally. For example if nozzle is .4 and shell is .8 then it will pick .4 for line width. Then it usually won't print any walls less than double that thickness (.8mm in this case). A quick test is to set your shell width to 0.6 and nozzle to 0.3 to see if more walls suddenly appear in layer view. It's okay to lie about nozzle width somewhat. 0.35 for a 0.4 nozzle works just fine. 0.2 for a 0.4 nozzle - not so good. it seemed like the extruder was stopping about .5mm short of the start point when hopping to a new start point. That is called "backlash" or "play" (you can look it up on wikipedia). It is very important to reduce backlash on a printer. Sometimes it is caused by too much friction. Check your axes. Sometimes it is something loose like belts or parts inside the head. With nozzle cold and power off try pushing on the nozzle to see if it moves without the head moving. Try pushing on the whole head. How much does it move before the steppers start rotating? That distance is backlash. Belts can be tightened if that is the issue. Search for belt tighteners on thingiverse for ideas and solutions. I am trying to print 3DLabPrint P38 with 0.4mm Nozzle and 0.4mm Wall Thickness. At areas with less slope I get additional, more or less interupted lines (yellow lines in the image) This parts show thru the outer wall and disturbs the appearance of the outside. Is there a setting to avoid this? I just use this to adjust where my Z Zero is. A G92 Z(value) will set the Z coordinate at that value. For example, for me its hard to move my limit switch, so if I am say .5mm to far over the table when I home out Z, I add a G92Z.5 right after I reach my limit switch. That way when I home out my Z Axis, and the software Zeroes me there, I so ahhh no no no, I am really .5mm to high, so I add the G92Z.5. The issues with not slicing the inner stuff could be the model, at least thats what I have been told by others. When I contacted 3dlabs they assured me the models are fine and its the slicer and I should buy S3D(ahhh not going to happen). I dont know what the setting is in the older curas, but in 2.6, and probably 2.4/5, its in the Mesh Fixes section(hidden by default). I enabled all to be seen in the workspace, and then unchecked all the boxes, and set "Merged Meshes Overlap" to 0mm. This caused those models that would not slice internals for me to slice just fine. I dont know which setting it was that worked. I could have been just one, or all, or any combo of them, but having them all unchecked and zeroed, I was able to slice all of them. Then there was the problem of slicing when there were multiple models on the workspace. This I could not fix, and had some slice correct, and some slice hollow. This was always with the ailerons. So to fix this, the ones that sliced hollow I removed, and the ones that sliced correctly I mirrored. The way I understand it, you want just enough to remove the back pressure on the filament between the extruder gear and the print nozle. Any more is useless and only causes more problems such as under extrusion on layer starts, or filament getting jammed in the tube, etc. I am fortunate to be able to rapid to pos pretty quick which helps a lot for my stringing. I still get some, but the faster I can get from point A to point B the less time the filament has to ooze out. Z seam is where the layer starts. These may be hidden by default too, so you may need to show them in your cura version. I dont know if version 15 has it, but 2.6 does. You basically tell cura to start each layer at the same location. You set it to "User Specified" and pick an X and Y coordinate. When I forced my layers to start in the same spot, I seen why I had holes all over my prints in the past and never knew why or how to get rid of them. 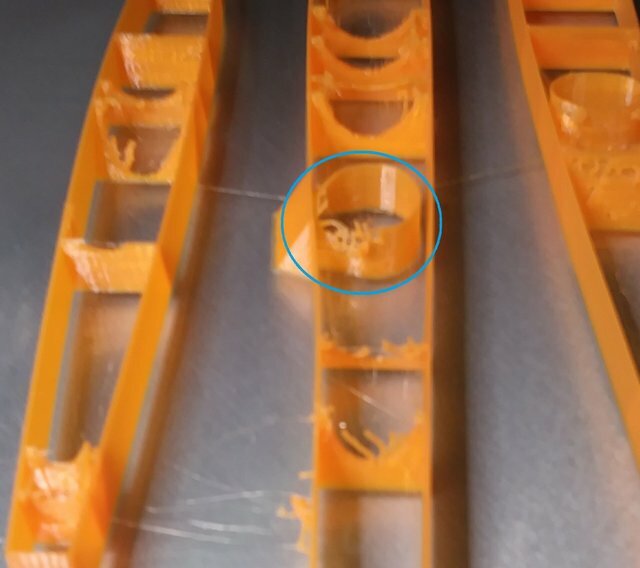 It was caused from under extrusion when the layer first starts, caused by oozing during the time it took to go from the previous layers last pos, to the next layers start pos. If I still had a print showing it I would post it but I dont. Anyways, by modifying the "Retraction Extra Prime Amount"(again in cura 2.6), I was able to eliminate all the holes. I have a coworker that tried to print one of the wing parts, and they seemed to get similar results as the original poster. Maybe I can borrow their printer and see if I can figure out the correct settings and what is causing the stringing and holes and report back here. I have spent some time playing with my coworkers printer trying to work out the kinks because he was getting similar results as you. His is not direct drive though, and even though it is not direct drive, I believe the problems are the same, his just needed a larger retract value. First thing I noticed is his retract speed was very very slow (12mm/s). What I seen was the printer actually pauses while its retracting causing the nozzle to melt the area for a but until it reaches its retract amount and rapid to the next position. I've tried up to 150mm/s and it doesn't seem to be going any faster than at the lower settings. You may have to change the firmware settings for your max speed and or acceleration. My Coworkers was also very slow (was set at 8.3mm/s) I did some print testing with a program Sliced from Cura, but running in Reptier Host(so I could issue commands). I Issued an M203 X20000 Y20000(setting Max Speed to 333mm/s) and M201 X3000 Y3000(setting max acceleration ). Now his is a small light printer and can go pretty fast, so you will have to play with the settings and see how fast you can get yours to move. I got his going as fast as it will go without the steppers skipping steps, and I am still getting a bit of stringing, but its much better than before. Increased his max speed so it can rapid faster, because like yours, it seemed to be clamped pretty slow. Everything else was just playing with the retract values finding the best one. See how at the bottom its got them holes? Thats because the Retract Extra Prime amount is set at zero, and I need to increase it until its all filled in. So far I have been moving in .5mm changes and at what looks to be about .25, its almost all filled in. If the value is set to high, then when the layer starts, you will see the wall thickness is drastically thicker than further down the layer path. Thats how you know its to high. To High it will be to thick at the start, to low it will be full of holes at the start. Unfortunately I was not able to remove all the stringing because to remove them I had to drop the temp a bit which made it look nice, but the layer adhesion was very poor. I tried slowing the print down giving the hot filament more time to try and stick, but nothing worked. I had to bump it back up to around 210C, which gave good strength, I had fine strings like the first pic. So I hope this helps you. Sorry its so long winded, and took so long to get back. I am no expert, I can only pass along what I have learned that worked for me. I hope these help you. If not, maybe you have Hot end issues. I have seen people comment on Hot end issues simply saying "Maybe you have hot end issues" but I have never seen a good example of what a hot end issue actually is. So I dont really know how to advise of there is actually an issue with your hotend. As a "not-yet-printing-this-model" reader i would just like to thank you for posting this very nice "how-to-optimize" guide.